Aww! That card is so, so absolutely adorable, Elena! That stamp set looks absolutely darling! Such a cute card, Love the little critter! So cute! Love the stars all over the card! Oh! The critters have more balloons to hold on to! aw, that little critter is too cute! Such a cool kit- thanks for the chance to win! Great card! Such an adorable card! You've worked magic with these two 'sweet' themed kits! Thank you for sharing this opportunity AND inspiration! love your Card, Elena! it is my favorite from the blog hop! thanks for the Chance to win! Your card is completely adorable!!! Clever stamp combining! And I especially love those little stars in the background. This is a beautiful card. Love the stamps. cute, cute, cute! love the ballons. The cuteness just kills me! Great card! Super cute card! And that critter is so adorable! What a cute card, thanks for sharing!! 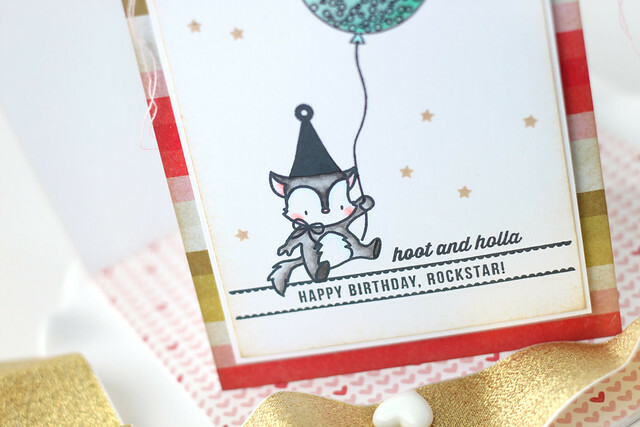 Hoot, hoot, hoot, what a sweet card. Just love the lil critter. Lovely work. Thank you for sharing. Love your fabulous card, Elena! Your card is too sweet! I love ME stamps and your talent just makes me love them that much more! So Adorable Elena!!! Love that you added the hat and the confetti in the balloon :) Love it! ADORABLE!!! Fabulous design -as Always! Love the card. It's sooo cute! Awwww....the little critter with that fabulous balloon is adorable!! What a fun way to pair these stamp sets! Such a darling card, Elena!!! Thanks so much for sharing it with us! Awww, so adorable! :D Nice coloring too. I'm loving all your cards Elena! I especially love the sewing detail on this card. Thanks for the inspiration. love this card, its soo cute! Such a cute card! That little critter is adorable! ADORABLE! Love the confetti filled balloon and the super sweet sentiment! I so like the confetti balloon! And love how you had the little critter holding it! Glossy Accents was the perfect touch! I just had to laugh at the sentiment! so so cute! Love the confetti balloon!!! cute card! So cute! Gotta have that balloon stamp! So so cute! Love the color combination! adorable card! Love the colours! I think this card is soooooo cute. I love everything about it, the stamps you combined as well as the paper you used and the blue from your balloon just pops against it all! Hope to win some SC and Mama Elephant goodies to scraplift this great card! Seriously adorable card. I said it before and I'll say it again, I'm crazy about that balloon. Too cute! I just love the balloon filled with confetti. Thanks for the chance to win, especially since today is my birthday. Ack...that balloon and that sentiment are just so perfect on this card! I love the little critter on the card! It's so adorable. Too cute and so sweet! Love your card. i do like it! nicely done. Such an adorable card! I love it. What a fun card! Love how you colored the balloon! 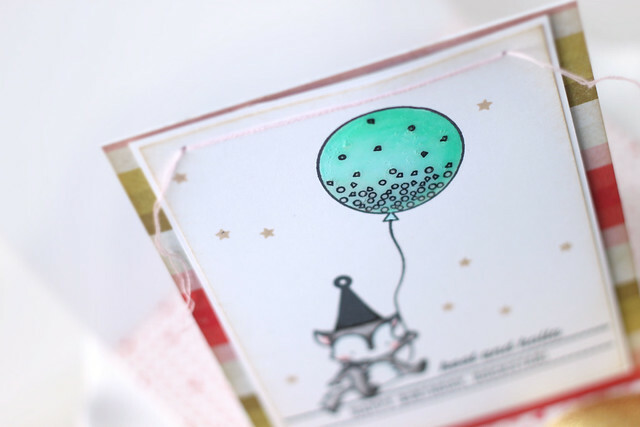 Love the fun balloon stamp! 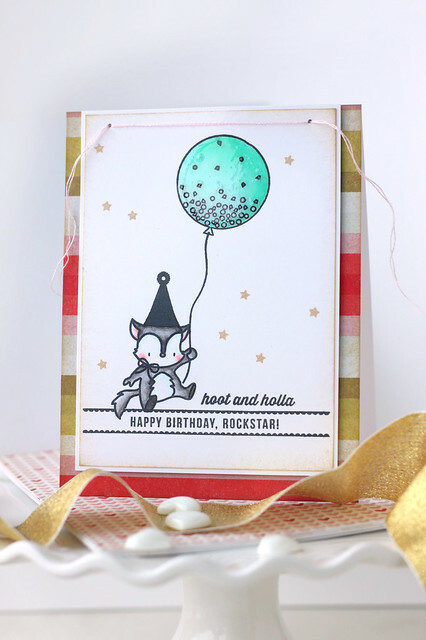 CUTE critter card - I seriously love the balloon! This card is so cute. The critter is so adorable. this is a really cute card! love it! What a cutie! I am going to have to check out that stamp set. Love both the imagr and the sentiment on this stamp set. Beautiful, fun card. So cute! I love the critter, he is adorable! Such a gorgeous card, the little critter is so adorable!!! cute card. thanks for the chance to win. Love love love this card!!!! Soooo cute! Wow! Love your cards, how gorgeous are they!? So cute, I love the balloon! That's one cute critter! I would love to get a chance to work with the kits. They're gorgeous! Great balloon stamp! Your card with the little critter is lots of fun!!! what an adorable card. I love how the sentiment goes along with the theme. That fox is a cutie! Such an adorable card, love the little guy with the balloons! What a cute card Elana! Thanks for the chance to win! What a cute set of cards! Nere xantza bilatzen segituko dut! What a very cute card!! so cute! Love the little raccoon! Fun seeing the set used with other stamps! Very versatile! pure sweetness! love it so much. So cute! I can't wait for this kit to arrive. I am always calling people rockstars so this stamp set is going to be perfect for me! I always love your cards and this one is no exception but it is exceptionally cute! Stop it - I cant take the cuteness! Oh my gosh that cute little guy holding the balloon is super adorable!!! What a great card! Such a happy looking card, Love the stamp! Is that a squirrel? Or a fox? Or neither? What the heck either way he looks too cute! So cute! I love the way you did the strings/thread at the top, this is adorable! A perfect pair up. This is adorable. Awww love your card!! It's so fun! Cute little fox! I like the organization of your blog! That is so dang cute! I love to see how you can combine different stamp sets to create something awesome like this! LOVE IT! Don't you just love balloons? I ADORE how you paired the stamp sets! That little guy holding the balloon is TOO cute! So cute - love the little critter. Adorable with this cute critter holding the balloon. Elena, your card is just too stinkin' cute. Thanks for sharing your idea. Very cute confetti balloon....awesome idea! teal is my favourite color - so that's my pick! Cute, cute, cute! Love you card! Sweet card! I love the little critter-- glad I already have him! I love how you combined these two sets to create the final image...adorable. This card is so stink'n cute! Adorable card. Love the color of the balloon! Sooooo adorable - love that shiny balloon...stunning. Thanks for the chance to win these amazing kits. This is super cute - I've already pinned it! Holla! What an adorable card love it have a great weekend! What a sweet little critter! I love this card. So adorable! looks fantastic combined with the little critter - the perfect combination of ME sets! The Mama E Up and Away stamp set is my absolute favorite!!!! Love that little guy partnered up with the balloon - super cute!!! Very cute. I love that confetti balloon. Aww he's just too cute! Lovelyinking at the edges and the tiny little stars - perfect birthday card for a little boy or girl! Blog hops are soo fun! Cute cards. Oh, this is super adorable, Elena!